Shellfish are at their tastiest this time of year, having properly plumped up over the last couple of months to weather the icy Canadian winter. Lobsters, mussels, oysters and scallops are all at their taste zenith, and they are always on my table during the holiday season. In preparation for this (and for the annual Great Canadian Oyster Experience, where the pairings are showcased), each year I gather a panel of taste experts to identify perfect shellfish and wine pairings. In past I focused on oysters, gathering a select group of refined palates to sample these bivalves from multiple origins with a wide range of wines. See last year’s report here. This year, I set my research team loose on scallops, particularly large, plump Nova Scotia scallops to be precise, and a range of WineAlign National Wine Award platinum and gold-winning VQA Ontario wines, in search of perfect pairings. Jump to the results below, or read on for some useful information on scallops. Sea scallops are mild, slightly sweet-flavoured morsels (though not as sweet as bay scallops) with a firm, pleasantly chewy texture. The nutritionally conscious will be pleased to learn that they are rich in healthy Omega-3 fatty acids, as well as vitamin B12, calcium, iron, magnesium, potassium, zinc, copper, phosphorus and selenium, and also an incredibly healthy source of protein, while being relatively low in calories (depending on the preparation!). Scallops are most often sold by count-per-pound, given a designation like U/10 or U/20, which means that there are Under 10 or 20 scallops per pound, respectively. They can also be marked as 10/20, meaning that there are between 10 and 20 scallops in each pound (.8 to 1.6 ounces each). In either case, the smaller the number, the bigger the scallops, and for the most part, the higher the price per pound will be. Scallops are harvested either by trawling or by diving. Environmentally conscious home cooks should look for the latter, sold as ‘diver scallops’, which refers to the harvesting method, not to any particular type of scallop. Trawling is done by scraping the ocean floor to pull up scallops (and whatever else is down there), without regard to the maturity of the shellfish or to the damage done to the ocean floor. Diver scallops are more expensive, of course. A further designation to look for is “dry pack” scallops. Dry pack scallops are packaged without additives, and don’t shrink as much as wet-packed scallops (which can lose almost half their size when cooked). It’s also tough to get that golden colour when searing wet-packed scallops as the water released during cooking tends to steam them. The Bay of Fundy is famous for its scallops, especially Digby scallops, named after the town in Nova Scotia where most of the commercial fishing fleets have their home base. Thus Digbys are not a particular species of scallop – you’ll find the same type of sea scallop throughout maritime fishing grounds – and may not even come from the waters immediately off-shore from Digby town. But any large-sized, diver-caught, dry-packed sea scallop from the maritimes at this time of year will be pretty damned tasty. Home cooks love scallops for their versatility. They’re suitable for a wide variety of preparations from raw (crudo, ceviche) to dry heat cooking methods like searing, grilling or sautéing, or wet heat methods like stir-frying and baking (with sauce), and simmering in soup, stew or risotto. Their, delicate, mild flavour also makes them a great canvass to showcase a wide range of accompanying sauces, mild to intense. Large sea scallops are usually best with dry heat methods, just keep in mind that since they are essentially pure, very lean protein (like filet mignon), they toughen up quickly if overcooked, moving from moist and succulent to dry and rubbery in the blink of an eye. So make sure that you remove them from the heat when they are still moist, juicy and plump (springy to the touch and still oozing some liquid). For this year’s tasting panel, I asked Chef Giovanna Alonzi of Terroni and Sud Forno to devise three radically different sea scallop preparations. Panelists were put into three teams. Each team was assigned one of the scallop dishes, and asked to taste it with nearly two-dozen VQA Ontario wines in order to choose a favourite pairing. I pre-selected the wines out of the 2017 WineAlign National Wine Awards of Canada platinum and gold winners, and included sparkling, white, rosé and red options. See below for the bios on each team, the preparation they were assigned, and their top pairing. At the time of writing, all wines are still available and recipes are provided so you can reproduce the menu right in your own home. 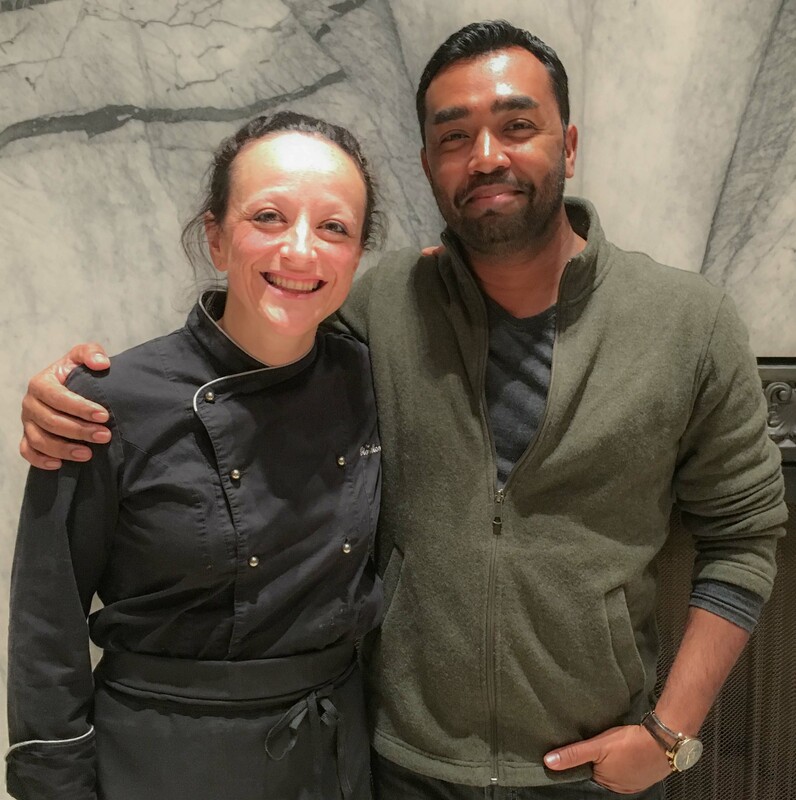 Alonzi’s Italian roots (she was born there) inform her culinary inspiration, and she now humbly bears the title of executive chef of the Terroni/Sud Forno Group of restaurants, Toronto’s beloved purveyor of authentic Italian food where no modifications is the house rule. When she’s not playing, cooking or baking at Sud Forno’s newest location on Temperance St., you’ll find, her doing the same things at home with partner Fabio and beautiful children Mattia and Alice. Fellow U of T and WSET Diploma Graduate Laura Ruffolo was my partner for preparation Nº 2. As Product Manager for Ontario Wines at the LCBO, and with her Italian background and strong wine knowledge in general, not to mention a direct connection to chef Alonzi (they went to high school together, by total coincidence), Ruffolo was a natural choice for this panel. And me, well, it was my idea so I bullied my way onto the team. “Our dish is really rich, with the nduja, zabaglione, and scallop, so we needed some acid to cut through. The touch of sweetness in the Fielding rosé was perfect to offset the subtle spice, while the fruit in the wine was a nice contrast to the slightly smoky-savoury elements.” – Laura Ruffolo. This strong team was composed of Jules Garton, a Certified Sommelier by both Court of Master Sommeliers and the Canadian Association of Professional Sommeliers, and inveterate saberer of sparkling wine. Garton is Director of Wine for Broadcloth Hospitality where she oversees the wine programs at The Oxley Public House, The Queen & Beaver, The Wickson Social, and the company’s latest addition, Mad Crush Wine Bar, which occupies the legendary former Bar Italia space in Little Italy on College Street, Toronto. Astrid Brummer is responsible for all Ontario wines at the LCBO/Vintage as category manager no less, and also brings a degree in oenology and viticulture from Brock University to the table. Magdalena Kaiser is a Master of Wine candidate and director of PR for the Wine Marketing Association of Ontario, as well as a bona fide shellfish specialist. Divide the above vegetables into four serving bowls, dust with pistachio and black olive dust, add marinated scallop per bowl, serve cold. Heat a searing pan for 2-3 minutes. Add 1 tbsp of olive oil.